If you are new to Sacred Heart Parish - Welcome! Hosted by our Knights of Columbus, everyone’s invited to our parish Family Day Pancake Breakfast on Sun, Feb 17, immediately after the 10am Mass. It will be a good time to share, mingle and get to know other parishioners. No charge or cost to enjoy delicious pancakes, sausages, eggs, hashbrowns, juice, coffee and tea. Donations gratefully accepted to help cover the cost. A letter - The Feast day of St. Bakhita (Feb 8th) - designated by the Pontifical Council for Justice and Peace as the annual day of prayer and awareness against human trafficking. You are invited to respond by visiting the website as indicted on the back page of the letter. Celebrate Christmas with Bishop Gary Gordon through LIVE online streaming of the Christmas Eve and Christmas Day Masses from St. Andrew’s Cathedral. Followed by a catered dinner in the Parish Hall. This year, the Development and Peace campaign Share the Journey will focus on helping refugees. There are 68.5 million people in the world who have been forced to flee their homes. That is double the population of Canada! It is time Canada did more to end forced migration. Please click on this link to learn more about refugees and how we can help them. Please join us Sunday, Oct 7 after the 10am Mass for a Thanksgiving Pancake Breakfast, hosted by our Knights of Columbus. No charge / cost - just a donation to help cover the cost of the food! Registration is open for September classes. Children, K to grade 7, including those preparing for the Sacraments, are invited to join classes held in the Parish Hall on Sundays from 11:00am - 12:00pm, Sept-April. Sacred Heart Parish invites everyone from this parish to a Welcome / Welcome Back Pancake Breakfast on Sunday, September 9th after the 10am Mass. If you are new or just returning after a long vacation, please join us. There is NO fee or charge to enjoy this meal, only a Free Will Offering at the door to help cover the cost. Registration Forms are available in the foyer, at the office, or downloadable here. Congratulations to those who received the Sacraments of Confirmation and First Holy Communion on Sunday, June 3, 2018. Lawal A, Tristan C, Isabela I, Siena L, Chloe M, Maria-V N, Abigail S, Alexander S, Elias T, Leah W, Ylinn W, Soon Yi Maria, Gye Sook Cecilia, Seung Gyu John, Sung Chan, Minah Noela, Sang Kyu Aguinas, Minjoo Juliana, Min Seong Albert, Hyo Jun, Hyeon Jin Michael, Jiho, Dongjin. Thank you to Bishop Gary, Fr. David, Fr. John and all the liturgical ministries involved in providing a beautiful celebration. Thank you to those who prepared and served the refreshments, and those who helped with the clean up. This year’s confirmands, their families, and the Sacramental Preparation Team thank Sacred Heart parishioners for being prayer partners and supporting their journey. Please continue to pray for them as they begin a new journey in discovering Christ in their lives. THANK YOU Sacred Heart parishioners for supporting the Service Project organized by the students of Sacramental Preparation Year 2. You helped raise $291.00 for SVdP Rosalie’s Village. We hope you enjoyed the ice-cream, baked goods, & fellowship. The names of children and adults from Sacred Heart and the Korean community who will be celebrating the Sacrament of Confirmation and/or Holy Communion are listed below. As they enter the final weeks of preparation, keep them in your prayers and sign the cards found on the table by their photos. Lawal A, Tristan C, Isabela I, Siena L, Chloe M, Maria-Victoria N, Abigail S, Alexander S, Elias T, Leah W, Ylinn W.
Sunday, May 6: Sacramental Preparation year 2 fundraiser for St. Vincent de Paul's Rosalie's Village. Baked goods and ice cream available by donation following 10:00am mass, and the Crowning of Mary. Knights of Colimbus invites you to our 2018 Mother’s Day Gala, on Sat, May 12 at Sacred Heart Parish Hall, with dinner & dance for only $20 (sgl) & $10 (addtl family members). Tickets: Parish Office & GK Steve 250-370-0083. Thank you to everyone involved in the Children’s Reconciliation Service on March 3 -- before, during and after the celebration: Father David for his gift of ministry and guest priests - Fr. Paul and Bishop Gary, teachers and musicians for their commitment to sharing their faith and their gifts, parents for their support of the program and at the reception, children willing to learn with an open heart, and our community for your continued prayers that all children will continue to grow in their faith and love of Jesus our Lord. Please pray for those children preparing to receive the Sacrament of Reconciliation for the first time, that they will know of a kind, loving, and forgiving God. Sign the cards, by their photos on the display board, to show your support. Thank you. Come join the children and families at this celebration and receive the Sacrament of Reconciliation. Stations of the Cross: Sunday, Mar 4, at 11:15 in the church. Led by Children’s Faith Formation. All are invited. Our Knights will be hosting a Pancake Breakfast on Sun, February 11 after the 10am Mass. There will be sausages, eggs, hashbrowns and pancakes. Coffee & tea included. Cost: Individuals $5 / Family $15. Our Knights will be hosting a Pancake Breakfast on Sun, November 12 after the 10am Mass. There will be sausages, eggs, hashbrowns and pancakes. Coffee & tea included. Cost: Individuals $5 / Family $15. The National Youth Forum on “Youth, Faith and Vocational Discernment” will be televised on Canada’s Salt and Light Catholic Television Network this Sunday evening, October 22, 2017, at 4:30PM and 8:30PM PDT, with the participation of Pope Francis and Cardinal Kevin Farrell. 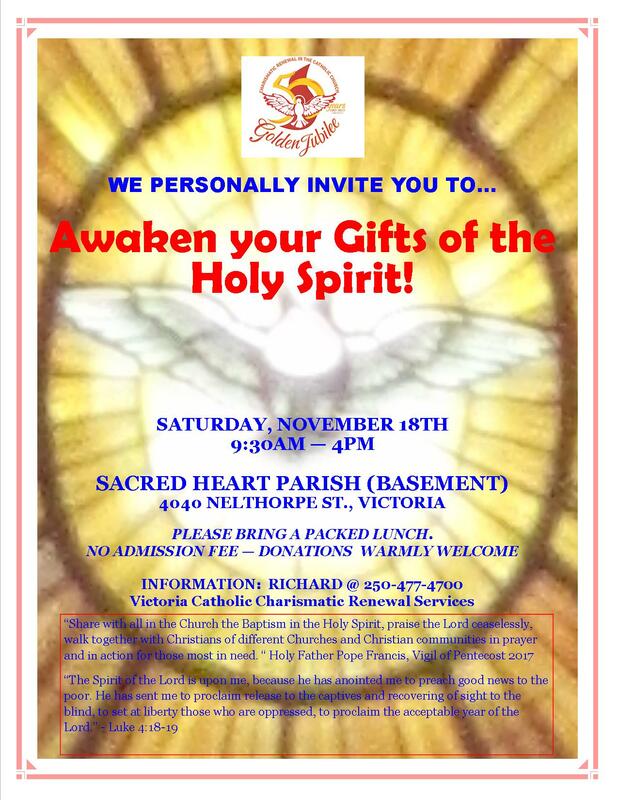 A Growth in the Spirit Seminar focusing on the gifts of the Holy Spirit will be held Saturday, Nov.18, 9:30 a.m.- 4 p.m. at Sacred Heart parish hall on 4040 Nelthorpe St. (near McKenzie Ave.). Talks and practical exercises are planned. No admission charge or collection, but donations are welcome. Bring a bag lunch. Sponsored by the diocesan core team for the Catholic Charismatic Renewal. For more information contact Richard or Lynn, richard@thedunstans.com, 250-477-4700. Raffle Draw at 1:00 p.m.
Sundays, 11:15am to 12:00pm in the church, beginning Sept 24. All are invited. We welcome Fr John Lee, the new pastor to the Korean Catholic Community and will be celebrating his 1st Mass this weekend. Our Knights will be hosting a Welcome Back / End of Summer Pancake Breakfast on Sun, Sept 10 after the 10am Mass. There will be sausages, eggs and pancakes. Coffee & tea included. Cost: Individuals $5 / Family $15. Beginning this fall, we will continue the study of the Bible with Part 2 - Matthew: The King and His Kingdom. This course is an ideal follow-up study to the basic narrative of Scripture taught in The Bible Timeline study, it is an exciting study that explores the life and mission of Jesus as recorded in the Gospel. Matthew demonstrates how the promises and prophecies of the Old Testament are fulfilled in Christ, who establishes a New Law and inaugurates the Kingdom of Heaven on earth. This study will help participants understand who Jesus is and what his life and teachings mean for us today. When: 24 Thursday evenings, 7:00pm to 9:00pm. September 14th - April 5th 2017. Cost: $50 for study guide book. Contact: Catherine Minvielle: cminvielle@shaw.ca, if you have any questions. To mark this special occasion we will begin the evening with a rosary procession at 5:30pm to bless all the cars in the parking lot. Immediately following the procession, Mass will begin in the Church at 6:00pm with a BBQ to follow. Hotdogs, hamburgers and soft drinks will be provided. Please bring a side dish or dessert (pot luck style). We will have music, cash bar and various celebrations into the evening. If you would like to make a donation for the event, donations can be received at the collection during Mass. 7:00 pm BBQ and festivities. We encourage you to sign-up on the Sign-Up sheets (in the foyer) to volunteer and to indicate the number attending. Please RSVP at 250-479 1611. Baked goods, ice cream and coffee available Sat. May 27 after 5:00pm mass, and Sun. May 28 after 10:00 am mass, by donation, for SVDP, Rosalie's Village. A service project organized by this year's confirmands. Enjoy a treat, give generously. Thank you for your support. Congratulations to those who received the Sacraments of Confirmation and First Holy Communion on Saturday, May 20, 2017. On behalf of this year’s confirmands, their families, and the Sacramental Team, we thank Sacred Heart parishioners for being prayer partners and supporting their journey. Thank you to everyone involved with the liturgical celebration and reception. Peace and blessings to all. The names of children and adults from Sacred Heart and the Korean community who will be celebrating the Sacrament of Confirmation and Holy Communion on Saturday, May 20 at 5:00 pm are listed below. As they enter the final weeks of preparation, keep them in your prayers and sign the cards found on the table by their photos. Knights of Columbus Sacred Heart Council is holding its Annual Mother’s Day Gala (Dinner & Dance) on Saturday, May 13 from 6:00pm to 11:30pm at St Andrew’s High School Gym. This year’s theme is “Rock-n-Roll Jam Session”, featuring music from the 50’s & 60’s. It’s going to be a family affair, as well as a rollicking night of dancing till dawn to band music. Tickets are $20 for singles / family head and $10 for additional family members, available from Dr. Oscar at 778-265-0013 or Parish Office. Come, support our charity, the K of C Fund for Persecuted Christians in the Middle East. We are pleased to advise that Holy Week Masses and the Good Friday Service celebrated by Bishop Gary at St. Andrew’s Cathedral will be live streamed this year. The link can be accessed here. On the occasion of the Cathedral’s 125th Anniversary year, the Diocese would like to honour various individuals from throughout the diocese for service to the local and / or diocesan church, the community and the world. Parishioners are invited to submit suggestions of award recipients. Award recipients must be 19 years of age or older, practicing Catholics who have rendered long standing service to the Catholic Church in the Diocese of Victoria, lay members of the faithful, and not on salary or having a contract position with a local parish or the diocese. To nominate an individual, please fill out this form and deposit in the ballot in the church foyer, Sunday collection or submit it to the parish office by 12pm on Friday, April 21 2017. All are welcome! Pancakes, eggs, hash browns and sausage will be served. $5 per person, $15 per family. STATIONS OF THE CROSS: Sunday, March 19 at 11:15am in the church. Led by Children's Faith Formation Ministry. All are invited to join. Thank you to everyone involved in the Children's Reconciliation Service on Sat. March 11 -- before, during and after the celebration: Father David for his gift of ministry to our community, and other invited priests; teachers and musicians for their commitment to sharing their faith and acts of service; children willing to learn with an open heart; parents for their support of the program; and our community for your continued prayers that all children will continue to grow in their faith and love of Jesus our Lord. Pray for those children who are preparing to receive the Sacrament of Reconciliation for the first time, that they will better understand God's love through this healing sacrament. Please sign the cards found at the back of the church. The children's reconciliation service will be on Saturday, Feb. 27, 1:00 pm. You are welcome to join them. The Stations of the Cross will be led by the Faith Formation ministry on Sunday, Feb. 28 at 11:15 am in the church. All are invited to join them. Click here for the statement by the CCCB President, Archbishop Paul-Andr� Durocher, on the joint fundraising campaign for Syrian refugees by Aid to the Church in Need Canada, CNEWA Canada, and the Canadian Catholic Organization for Development and Peace. Please see attached memo and related information from Bishop Gary regarding the "Directions in Aboriginal Ministry Conference" being held in August, at Rosemary Heights.